It works along the lines of a regular bank ATM machine. You put in a major credit card and then choose what cupcake(s) you’d like to “withdraw.” When fully stocked the machine has an inventory of around 600 cupcakes in dozens of flavors. There are even doggie cupcakes, so Fido can use his credit card to procure a cupcake as well. 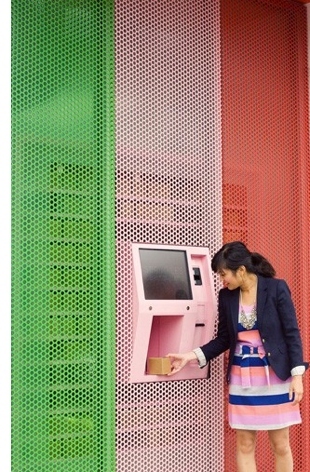 The inner workings of the ATM are visible behind the mesh wall (see first photo, below). But you’ll get a better view after you select your cupcake. That’s when the ATM screen will stream the live video from a camera mounted on the internal robotic arm as it goes to retrieve your cupcake selection. If you think the ATM is a gimmick to sell bland baked goods, think again. Sprinkles makes some of the best cupcakes on the planet. During the day there are typically long lines outside the store. At 3am there are typically long lines at the ATM. And you’ll find all manner of people waiting in them, from celebrities to inebriated college kids. The cupcake ATM even has its own Twitter account with over 1,800 followers. 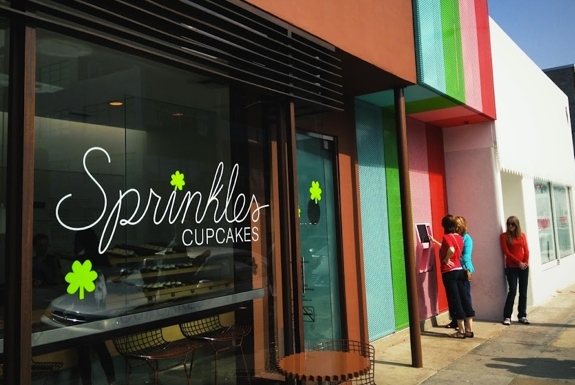 Sprinkles Cupcakes also has stores in other United States locations including Chicago, Dallas, Houston, New York City, Newport Beach, Palo Alto, Scottsdale and Washington DC. Though at all of those stores you’ll have to buy your cupcakes the old fashion way. You know, from a human.